forum.419eater.com :: View topic - Oh dear! 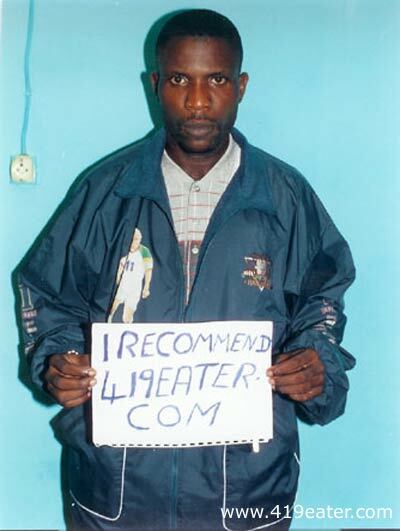 Seems like Patrick (pic below) has finally sussed out that he has a starring role on the homepage of 419eater.com and his is none too pleased! Strangely enough, he emailed me from a different account to the one he has been trying to scam me from (but the same IP address). Lots of abuse as per usual, but this time I am warned that if I do not remove his picture he will report ME to the FBI and make me pay for using an unauthorised image! Can we see his abuse letter please?? Does this mean you won't be getting the �25M? Perhaps you could offer to remove it if he sent you some of the money for free or failing that sends you another picture in a suitably amusing pose. We MUST see the letter! Post it here - or better yet on the frontpage! Does this mean that lads own copyright over their silly pictures? Being the originators of the pictures, they certainly own copyright over them. From a legal point of view they can certainly insist their pictures to be removed from the public, as they have never given their permission them to be published. But I doubt they have the means to force you to do that. Tell him that you have forwarded a copy of his complaint to you along with his picture to the FBI and told them that they can do as they wish but that the reason it was placed on your site is so that people can be warned properly of his ILLEGAL SCAMMING, THIEVING, FRAUDULANT ( they hate to be called a fraud) ways. Oh yes, I'm well aware the lads own copyright on their pictures. As already mentioned it's highly unlikely that they would take legal action to have the pictures removed, that would be very dumb (but what am I saying?!). What would be even more infuriating to them would be if you told them you posted their pic on a personals dating site for gay men. Well, if ever they need a good lawyer, i got some good pics of them too!!! That's trade mark. You have copyright on everything you create without any further action or notice to anyone. Location: If you've seen the movie "Witness" you know where I live! Komsomol, from a legal standpoint in the USA, that would not necessarily be true. Even if the mugu owned an actual copyright on his photo, we have a law in place here (Section 107 of the U.S. Code) called "Fair Use" which allows for the use of copyrighted material without the copyright holder's permission if it is being used for educational or informational purposes. Considering that the site in question is both educational and informational, warning potential victims of 419 fraud, I would think that this falls well within the boundaries of "fair use". I would imagine there must be similar laws in the United Kingdom. Or, you could photoshop the pic so the sign says something about a pending bomb attack and send it back to him along with a note telling him you've sent it to the African bureau of the CIA. Oh thanks. I wasn't aware of that. I only knew that there were certain exceptions like quotes and such, but I think you are right and this makes it clear. Thanks for clearing that up! This means that I can put a copyright notice on my website's drawings, which I never did because I didn't knew how to register them, right? Apart from special exceptions like just clarified by NomDePlume, your work is protected by international law anyway, and you are not obliged to put any notice. But of course you may if you wish. Now, from what I see, he has helped you make promotional material for your website, which seems to imply that he does, in fact recommend said site. Ask him to send you 3800 US DOLLARS ONLY FOR THE MODALITIES and the picture will be removed, 100% RYSK FREE. Otherwise, be prepared to meet him IN KORT! he doesn't have much legal ground to stand on.... although, I don't know much about UK law. Just tell him to quit his whining or you will tell every mugu you encounter that he is helping to uncover scammers in [Lagos Nigeria?] or wherever he is operating out of.